April is the first full month of spring and a time of transitions. The days are longer and warmer and we can see the evidence of the earth awakening from its winter slumber in the bloom of the trees and plants. Of course we take our cue from our surroundings and we are eager to join in on the action. Let's see how the Moons of April are going to support your initial steps as we begin the new season. The New Moon in Aries arrives on March 30th and you are focused on the attainment of your desires...and ready to do whatever it takes to win! Complications arise from a transit with Uranus that will diminish this New Moon. You simply will not have the energies available to make that forward leap that you have been anticipating and it will cause frustration. You sense that patience is the key even though you've had enough of waiting. Take another look at your present and make sure that you have everything that you need to proceed. It will be a worthwhile task and the additional patience will be rewarded. 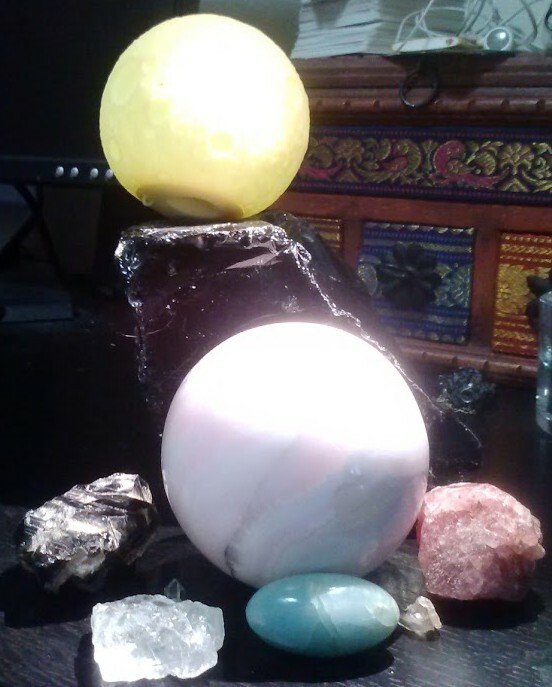 Strawberry Quartz will provide guidance, while Black Obsidian will help you manage the sense of urgency. April 7th brings the First Quarter in Cancer encouraging you to look towards your home for resources and inspiration. Home does not have to mean your actual domicile. It could be family, friends, work or community. It is the close circle that is present in your life that brings you the comfort and nurturing of "home". This is great energy for a trip so go to your favorite "power place" to feel recharged and reinvigorated. Smokey Quartz is always a great traveling companion. Pink Calcite will show you how to benefit from your nurturing support system. There is an awesome opportunity at the April 15th Full Moon in Libra that will be difficult to recognize. You want to rush ahead and make things happen and you don't want to wait, but the Libra Moon demands balance. This Libra Moon is a gift not a barrier. If you consider that in April you have just as much chance of snow as you do flowers, then you can really appreciate the timing of this Full Moon. Use it to find your footing before you rush ahead. Don't underrate the value of patience and plans. It is a mistake not to use this powerful influence when we are under the influence of fleet-footed Aries. Why tumble in haste when you could maintain a steady pace that will get you exactly where you want to go in the most expedient method? Topaz will highlight the importance of finding balance now, while Aquamarine shows you how to work with the current energies. Finally we reach the Last Quarter in Aquarius on April 22nd when it is time to honor your achievements. Are you still thinking of the New Moon and feeling as if you did not get as far as you had hoped? You used the energies that you had to work with and set revised goals and a new timeline. That is an extraordinary achievement! It is not easy to set aside your itinerary and re-calculate your route but you did it anyway. Adaptability is an awesome achievement so wrap your mind around that and be proud. Green Chlorite will connect you to the Earth Cycle (it is speeding up in May!) while Danburite lets you recognize that you are right where you are meant to be.